We are unchained! Left Vero for Fort Lauderdale! Wow! I didn’t realize it has been so long since my last post! I will start with the current situation and work my way backwards. 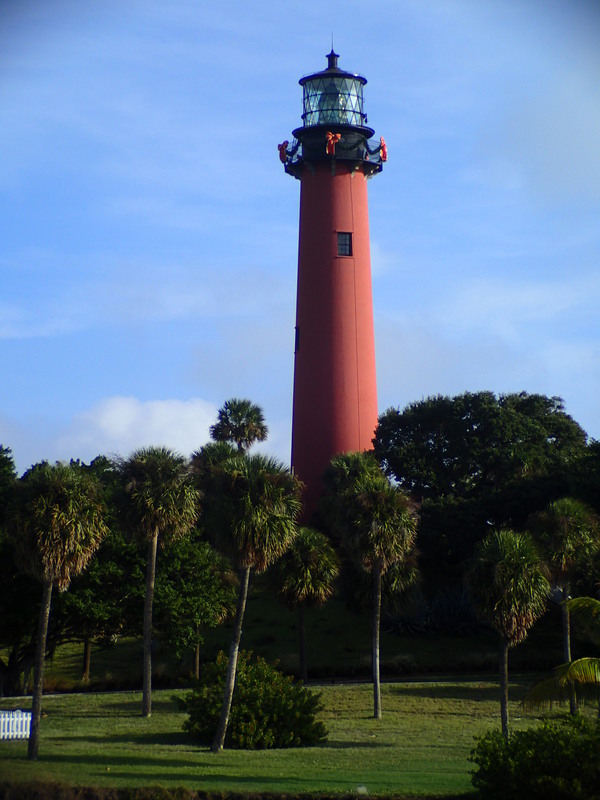 We left Vero on Wednesday and anchored in Hobe Sound. On Thursday we anchored in Lantana. Today we are enroute to Fort Lauderdale. We are traveling with Harry and Fran/SIRIUS. It is a very challenging day since we have 17 opening bridges along the ICW all with different times to open, etc. The houses along this section of the ICW are amazing. All of them over million dollars and many of them look like castles with boats out front of their houses that are as big as their houses. It’s incredible how many there are of them! I am sure our boat would fit in one of the closets! Almost every empty lot here is now having a house built on it. Some look like they tore down old houses to put up a mansion. Most are on peninsulas or points along the ICW and are massive! For the past four or five years there has been very little construction and lots of for sale signs This time building is everywhere and there are only a few for sale signs. I guess the economy for some is doing just fine! We stayed in Vero for 19 days! Can’t believe we stayed so long. We did get all our engine work completed. Some of the new work was a new water pump, new windlass, new anchor light installed, fuel injector issue fixed, new water hoses and other smaller stuff. Tom has been very busy. Lucky for me he knows how to do most of the repair work himself. 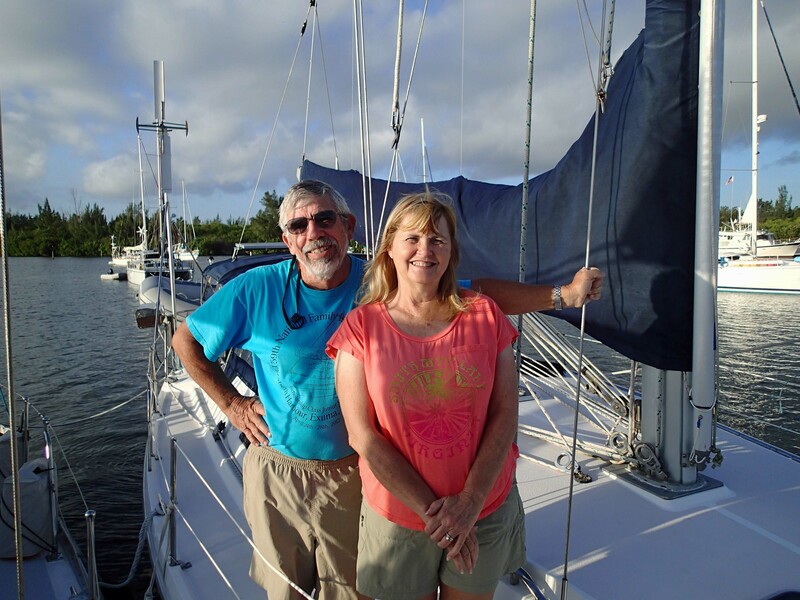 We were anchored on a mooring ball with Bert and Pru/EXHUBERANT. 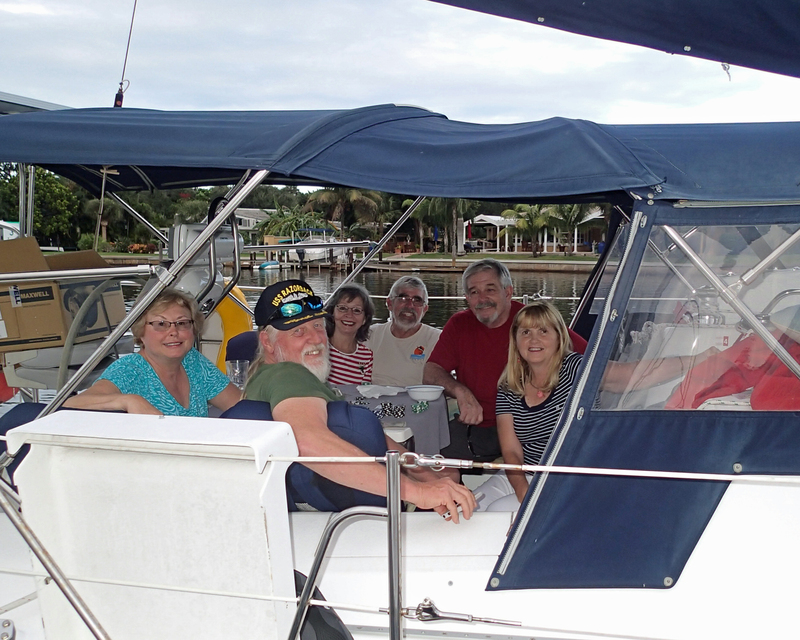 They were great mooring buddies and we had fun time teasing each other about how long we were in Vero. They left Wednesday also but are going outside and heading to Miami. We will miss them but we will catch up with them in the Bahamas. 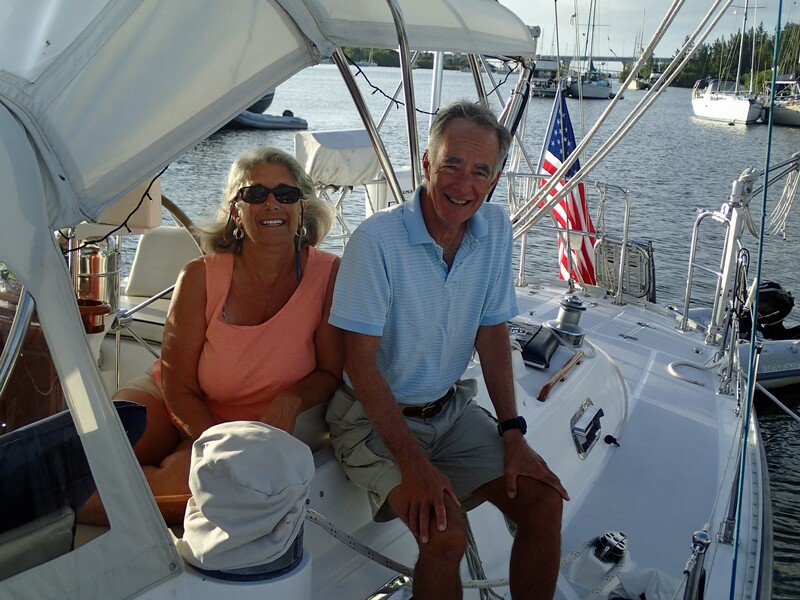 Tom and Cathie leaving our mooring ball in Vero. Vero Beach is a very cruiser friendly area. The mooring balls are $11 a day which includes showers, laundry facilities, lounge and a free city bus that picks you up In front of the marina. They have a mail service where they collect mail and packages for the boaters which helps a bunch when you need to order new parts and other items for the boat. The weather is about 10 degrees or more warmer than in St. Augustine. While we were in Vero we looked up and saw a rocket launch from the cape. It was very big and bright. Unfortunately by the time I ran down to get my camera the photo is not very spectular. There was an impressive cone around it like a comet because of the condensation which made it an incredible sight. We were able to see the first stage drop off and the second stage kick in. It lasted quite a while. We tried three times during previous cruises to be around to see launches and they were all postponed. A few of them we waited an extra week only to be disappointed. This time we were able to see it and we didn’t plan on it. Go figure! Sometimes you just get lucky. Space Shot from Cape Canaveral. It was spectacular…sorry the photo was taken too late and it was moving away. 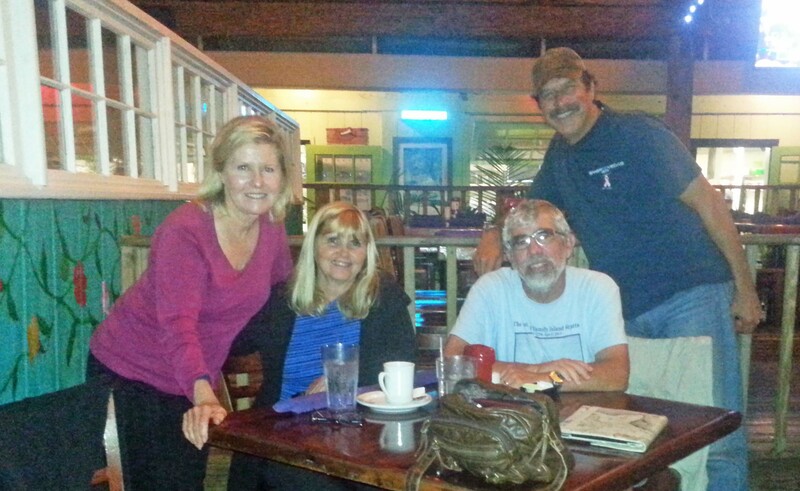 We were able to catch up while in Vero with other cruisers who are going back south or who have houses in Vero. Thanks so much to Daisy, Greg and Donna for the lovely dinner and Linda and Hutch for all the trips to the store and dinners out. We were very happy to visit with Jan and Mark and puppy Sailor who are staying on their boat in Stuart but drove to Vero to say hi. We had a fun time with them. We also got a surprise when Bob and Penny/PRETTY PENNY and Dennis and Bettye/MISS BETTYE drove from St. Augustine to visit and play some Texas Hold’Em! I was the winner! I guess I was not a great hostess by winning especially when Bettye brought us homemade cookies! Thanks for taking the time and effort to come and see us. It was great fun! Looking forward to seeing you in the Bahamas! 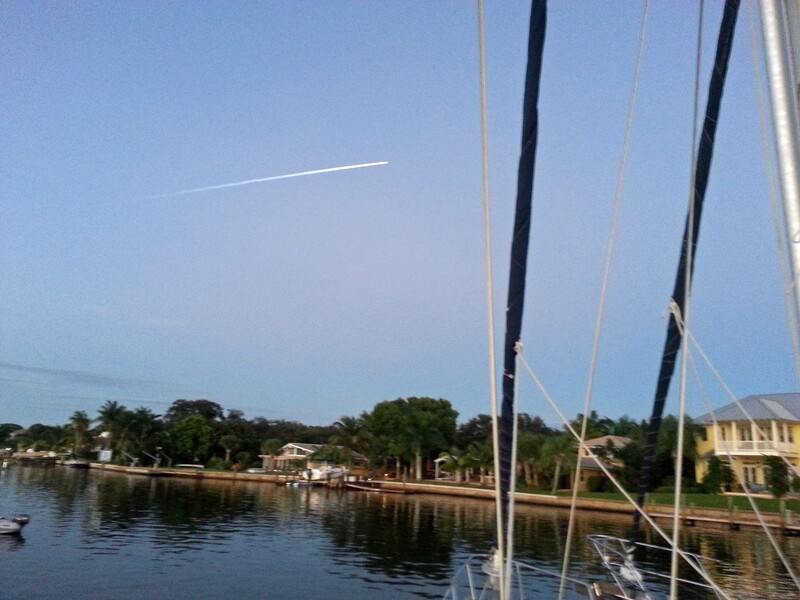 We had another wonderful surprise when we anchored in Lantana. We found out that Linda and Mike/AQUILA now RVing in their motorhome THE BEAR stopped by to see us at the tiki restaurant near the anchorage. They are from California and have been touring the U.S. Didn’t think we would see them for a few years. 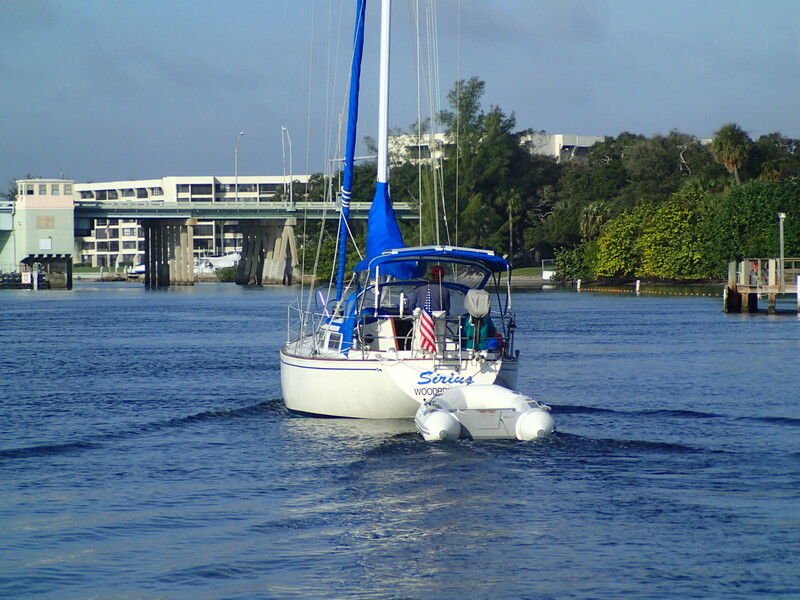 They flew down to check on !heir beautiful boat that is up for sale…a Hylas 49. Thanks so much for making the effort to see us. It was great!